As the Fed chatter crescendos with the approaching conclusion of QE2, and the ECB widely expected to raise interest rates this coming Thursday, stormier seas are forecast to arrive in the financial markets at any moment. And while asset prices have continued their collective ascent on the backs of an accommodative Fed, the box has only gotten smaller in terms of their respective maneuvers within it. 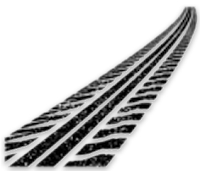 This could be where some rubber meets the road for the inflationistas. It also may be a good time to look back at 1994 as an analog to understanding risks within the bond, currency and equity markets. In 1994, central bankers were widely seen as falling behind the curve in terms of managing inflation expectations. To neutralize the risk, they had to adjust interest rate policies in a synchronized fashion to get out ahead of it. The result was a brutal bond sell-off (will the vigilantes ride again??) and an equity market that traded sideways for the better part of a year. I believe we may be looking at a similar market scenario (congruent to 2004 for equities) that could have pronounced effects towards the bond and commodities markets and the dollar. The chart below has been constructed to illustrate a few key points. I chose to utilize the Transportation Index relative to the S&P 500 as a proxy of the overall animal spirits within the system. 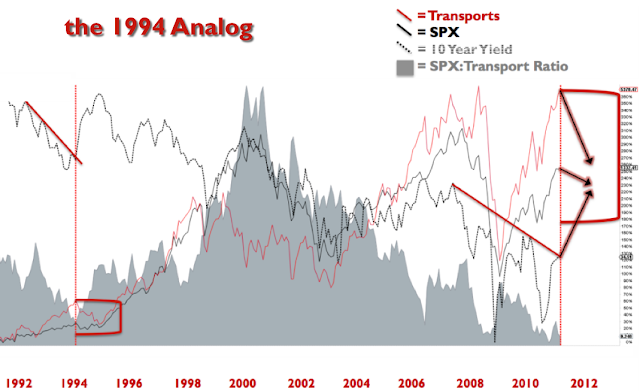 As you can see, the transports have outperformed the S&P by the widest margin since the start of the secular bull market in 1982 (apologies - the chart only goes back to 1992). And while generally speaking, it is healthy to see the transports leading the broader market higher, the spread differential articulates a cautionary tone in the near to intermediate time frames. Throw in a rising 10 year yield and a central banking system approaching a monetary policy inflection point, and voila - friction. Tangentially, this could prove to be a significant top for the commodities market and a important low for the dollar. And while my work and suspicions lead me to believe it will just be a rather large skid mark in the reflationary road, you never really know how fat the tail is - until it has either run you over or is in the rear view mirror.